[Leigh: Some thought-provoking points provided by the lovely Amadeus, who was only 11 at the time this article was written. ]Mushroom Samba is one of the rare opportunities in CB where the Bebop crew have lost conscious control of their actions. While the very picture of a lipstick-smeared Jet talking to bonsais is comical and out-of-place, such farcical moments have proven to contain something deeper and more critical to the Cowboy Bebop story. With the exception of Ed and Ein, the heavily drugged Bebop crew aren't quite aware of each other's existence in the dream-like states they're in. "Hahaha, the world really is a great place!" Jet says. Supposing Jet is referring to being by himself, just tending bonsai, being a free soul? His hippie costume in Cowboy Funk could either be a coincidence or it could be taken as some form of evidence for this. 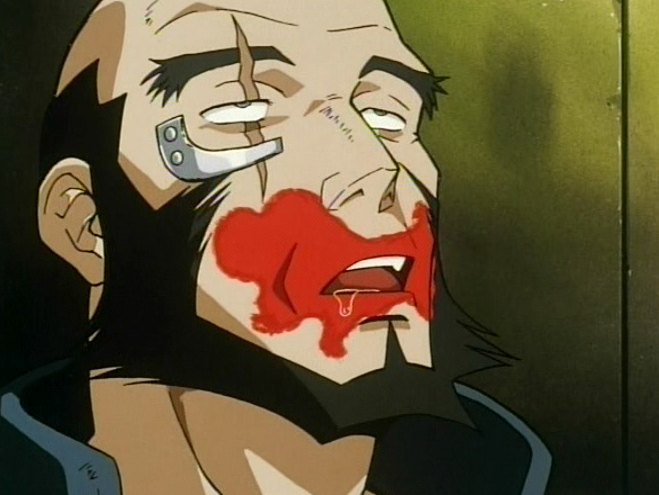 After all, Jet is an old-fashioned and simple man at heart. Recall some moments in Knockin' on Heaven's Door-- the planes he borrowed for Spike's plan were all old ones and while this may not be the strongest evidence of Jet's nature it is food for thought nonetheless. As for the lipstick, consider its deceivingly ordinary colour: red. Granted the lipstick belongs to Faye and it could well be a question of personal choice. But why in the future world of space travel and hippie space towns couldn't the lipstick any other color? Some shade of pink? Blue? Purple even? Supposing the creators of CB were intending to use this prop as a way to highlight another "theme" in CB. Red holds much symbolism in the story; in Spike's more unpleasant memories of the past (as the sepia toned flashbacks appear as to be "happy" ones) the important and symbolic items such as roses on the ground and the Bloody Eye by the nightstand are highlighted in red highlighted in red. 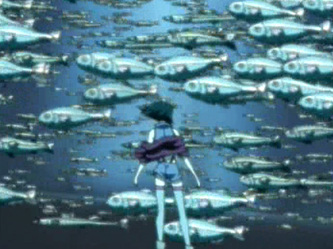 This is fairly straightforward-- Faye is the only one that truly stands out of the school of fish; she is struggling to swim in the crowd. Faye is basically alone in the world, and with her looks and attitude, there is no doubt she really stands out. 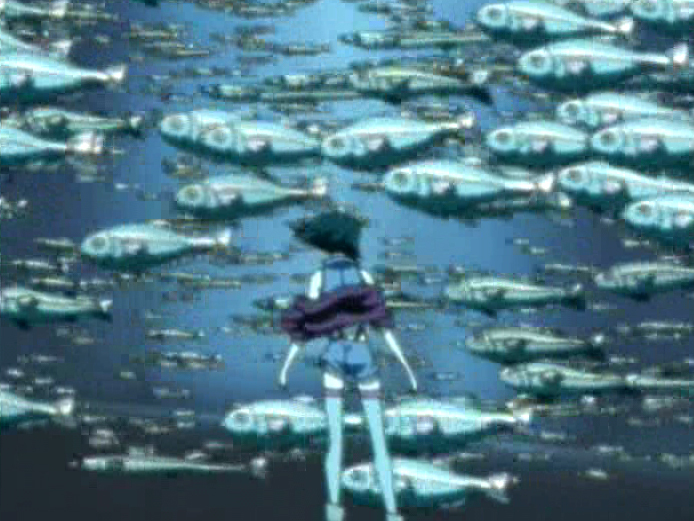 The fish are symbolic of her struggling to swim out of her troubles, It could also be that it represents Faye 3 years previously... alone, and trying to find some way out. Not too different from what she is now, actually. She still struggles though she hides it to prevent signs of feminine weakness. Other than the Led Zeppelin references, Spike's hallucination seems very different from Faye and Jet's in the comical department. 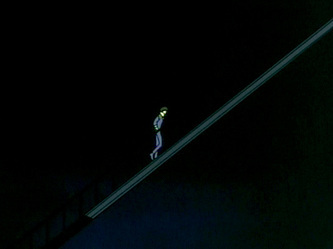 He's walking on a gigantic stairway to heaven staring blankly up the way and walking lifelessly. Pretty much Spike as he is (putting the past in the "fridge" for a moment)- lost, aimless, walking on and on an endless staircase. Of course, the staircase he walked on ended with his death. Interestingly, Spike died on the stairs of the Red Dragon's headquarters. He may or may not have gotten to heaven on the Red Dragon staircase, but it certainly looked more welcoming than the "stairway to heaven" in Mushroom Samba, which is dark, narrow, and afloat in space. In rough contrast to the Red Dragon stairs, which is beautiful, light, has wide steps, and is on the ground, firm, "sure" of itself and steady... perhaps a reflection of Spike's mentality as he approached his death. 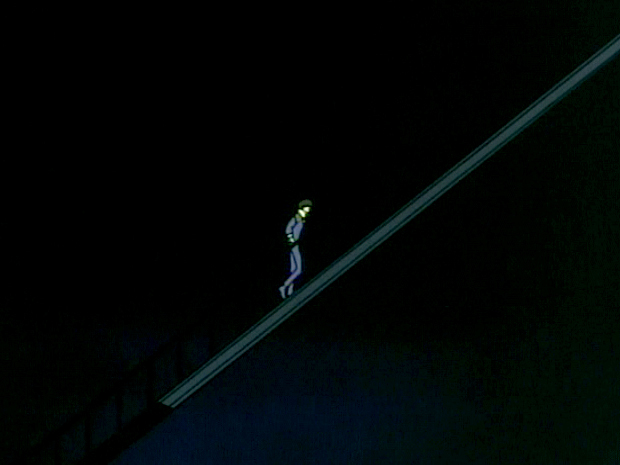 As the camera pans up towards a clear blue sky in the end, it becomes clear that the two stairways are opposites of each other, offering a very contrast of Spike "before and after" in Cowboy Bebop.